The Golden State Warriors pulled most of their starters after the third quarter Thursday. 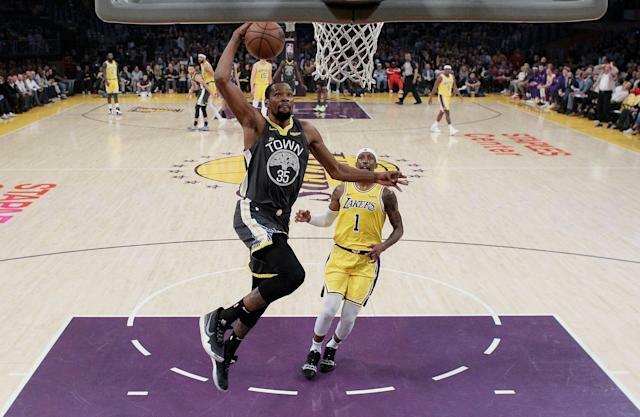 Holding a 94-66 lead over the Los Angeles Lakers, there was little need for Golden State to keep its cast of All-Stars on the floor in a game it would go on to win 108-90. For safe measure, Klay Thompson accompanied a crew of backups to start the fourth quarter that mercifully ended the Warriors’ season series with a lottery-bound Lakers team. It was a win that epitomized the divergent paths of the two teams: one ramping up to playoff gear in a quest for a fourth championship in five years — another counting down the days until a disastrous season ends as its best players watched from the bench. As Stephen Curry connected on a stunning three-quarter court behind-the-back pass to a wide open Kevin Durant, LeBron James watched in street clothes alongside Kyle Kuzma and Lonzo Ball, all of them shut down in a season lost long ago. For the first time in five seasons, the last matchup of James’ and Curry’s teams won’t take place in the final game of the playoffs. It was a dominant performance from the Warriors, another impressive romp that could signal a shift from a sometimes lackluster regular season as the games that matter approach. A 47-point romp over the Charlotte Hornets and a 14-point win over the Denver Nuggets this week have also seen the Warriors at their best. Golden State opened the game on a tear, mounting a 39-12 lead in the first quarter. The anonymous Lakers lineup never stood a chance, even on a night that saw Stephen Curry score just 7 points. Thompson, Durant, DeMarcus Cousins and Draymond Green all chipped in double-digit contributions in a balanced effort that saw Cousins lead the way with 21 points. Meanwhile a guy named Johnathan Williams led the Lakers with 17 points off the bench as rookie Mortiz Wagner paced the starting unit with 13 points. The Lakers have three games remaining in a season that can’t end soon enough.